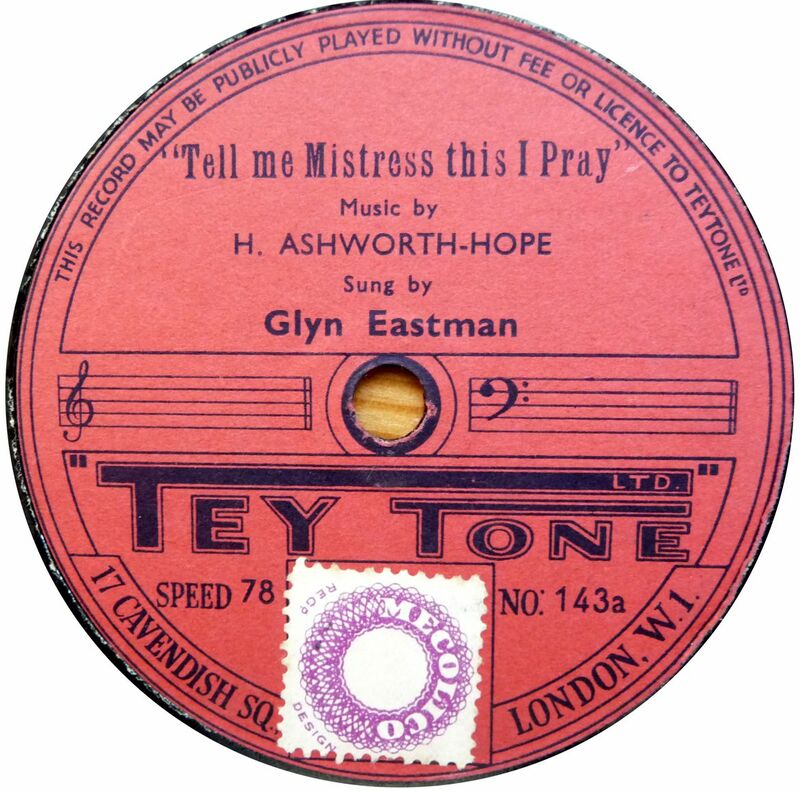 British 78rpm record labels whose name begins with T. Using the letter links below you can see pages for other letters. Tabansi Dating to post-WWII (I would guess), this was made by EMI for export to Nigeria. 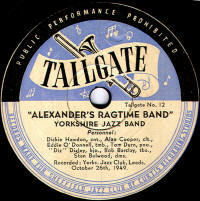 Tailgate A post-WWII label produced by the Sheffield Jazz Club devoted to British Trad. Jazz bands. 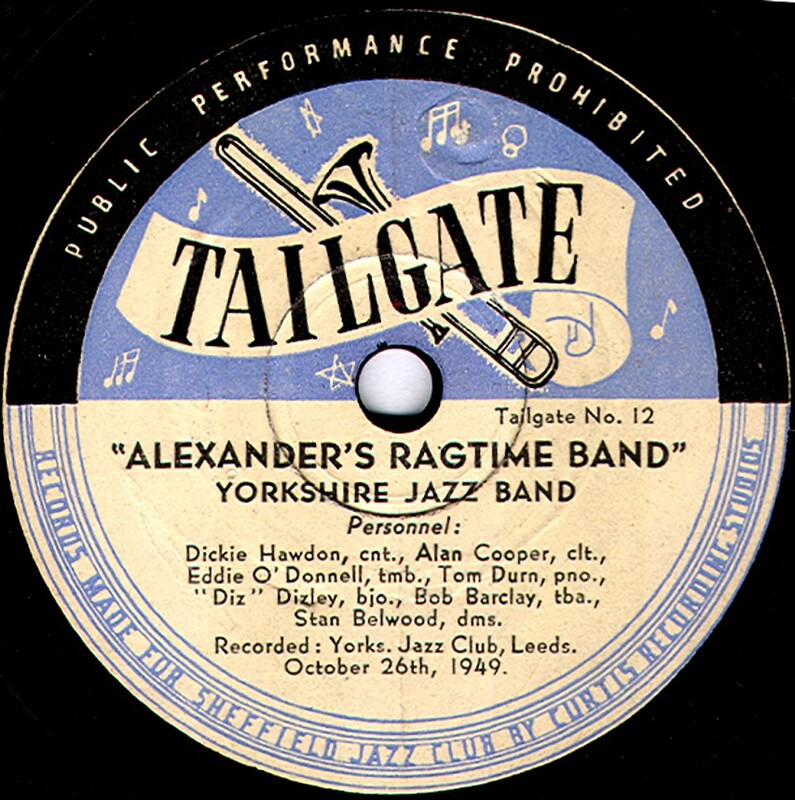 Tailgate records first appeared in late 1949, pressed in vinyl and were available from the club at 159, Alnwick Road, Sheffield and also from the International Book Club of London. They cost 5/9 for 10" and 7/- for 12" records. 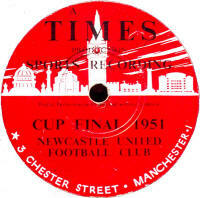 The records were recorded by Curtis Recording Studios of Sheffield. They had no ctalogue numbers, just face numbers, from 1 to 18. 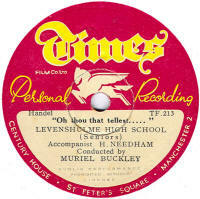 Talent Another post-WWII Sheffield jazz label, again making its appearance in late 1949 and recorded by Curtis Studios in Sheffield. 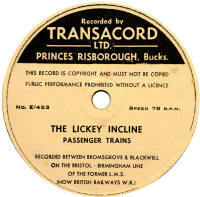 Talent records cost 7/6 and were available from L. Corbridge at 19, Vauxhall Road, Sheffield 9 and also from the London Jazz Club. Tamar This would appear to be a private recording company, presumbly based near the border of Devon & Cornwall. The example shown here is an acetate. 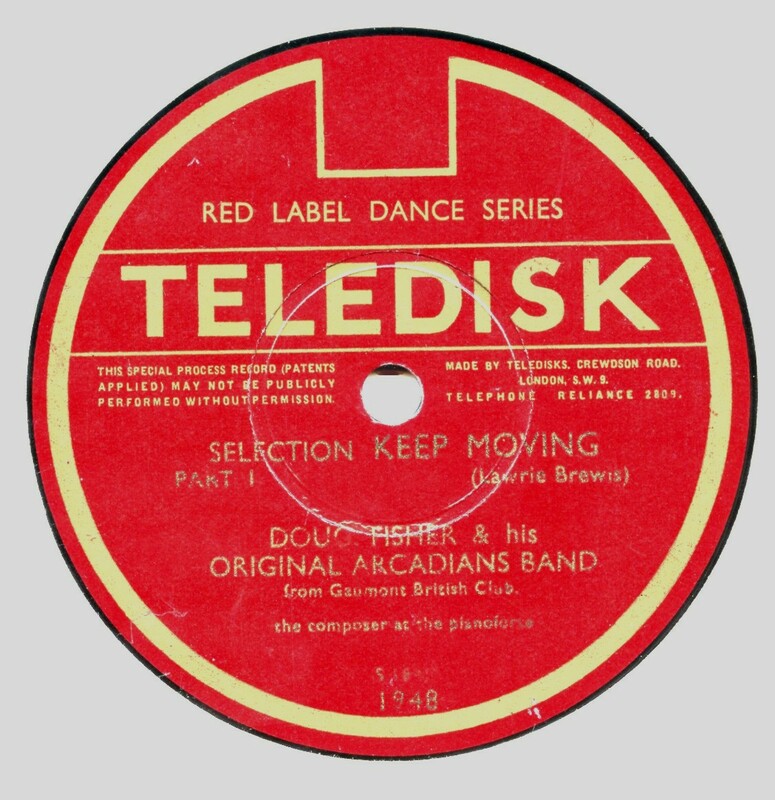 Teledisk Teledisk were custom record makers, offering to record you for a small sum, for which you would receive a small number of the recordings, double-sided and pressed on standard shellac. To be honest, the quality of the recording and pressing varied considerably and some are really dreadful. The labels were either blue or red (as picture here) depending usually on the type of fare being offered. 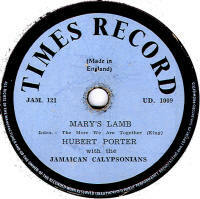 The records date from 1934-35 and are, as you'd expect, extremely rare. The company was at Crewdson Road, London SW9. Telefunken Telefunken records first appeared in the early 1930s, I believe, and were a German-only product as you could guess by the name. They do turn up occasionally in Britian, since one or two companies imported them. In the mid-1930s Keith Prowse, Rimington Van Wyck and Alfred Imhof were amongst these. The example here is from the 1950's and is British made by Decca, who manufactured Telefunken LPs at that period. 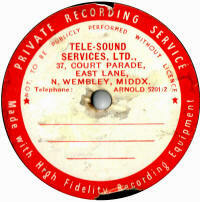 Tele-Sound Services Thanks to Bill Dean-Myatt for this label image. 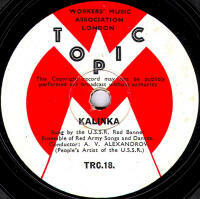 Tempo Tempo records first appeared in Setpenber 1946 and issued both new Jazz recordings and also vintage transfers. 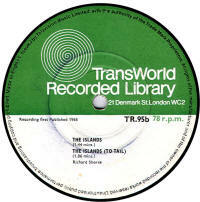 The new recordings had a A- prefixed catalogue and the reissues an R- catalogue (both series starting logically at 1). 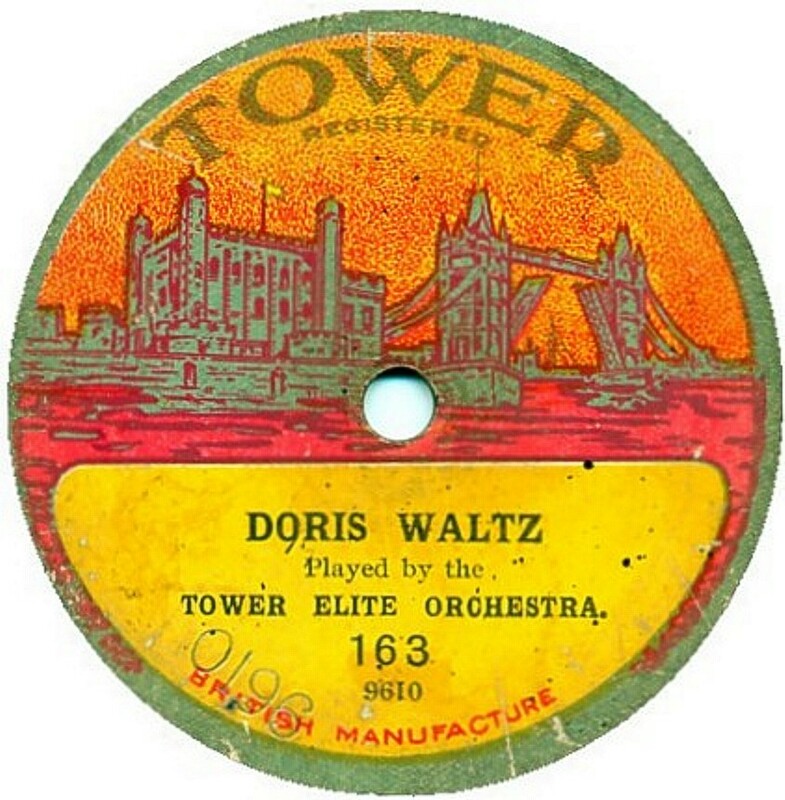 They were distributed by the Tempo Record Society of 9, Piccadilly Arcade, London and available from specialist dealers and jazz clubs. The initial issue of A-1 to A-44 cost 9/6, but subsequent issues in both series were 7/6. 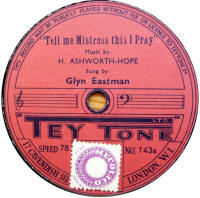 Teytone A small record company at 17, Cavendish Square, London, possibly dating from the 1950s. 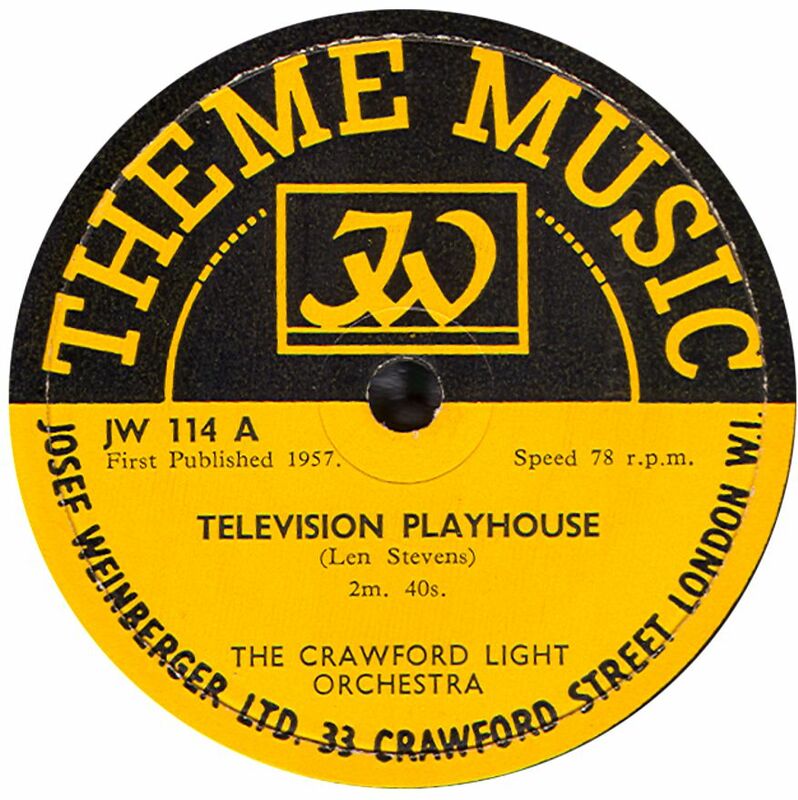 Theme Music This was a 1950s-60s label publishing library music for the Josef Weinberger publishing house. Times The first three label styles shown here, are all from Manchester and are likely to be the product of the same company. They appear to all date from the early 1950s. The fourth image is probably from another company, about which nothing is known. 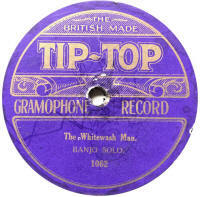 Tip Top This was a paste-over label of 1919 vintage which was an attempt to sell off old stock of Winner records. Tivoli A very anonymous looking label which gives no clue as to the manufacturer or the proprietor. The label design is almost identical to "Solitaire", so there must be a close connection. Record Club This record club dates from the mid-1950s. 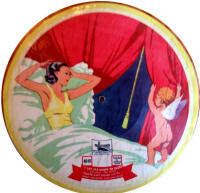 They issued cover versions of 12 of the most popular songs (usually 6 on each rcord, three on each side) every 6 weeks. 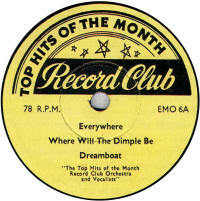 Fromt the catalogue numbering, it would appear there was some link with the "Tivoli" record above. 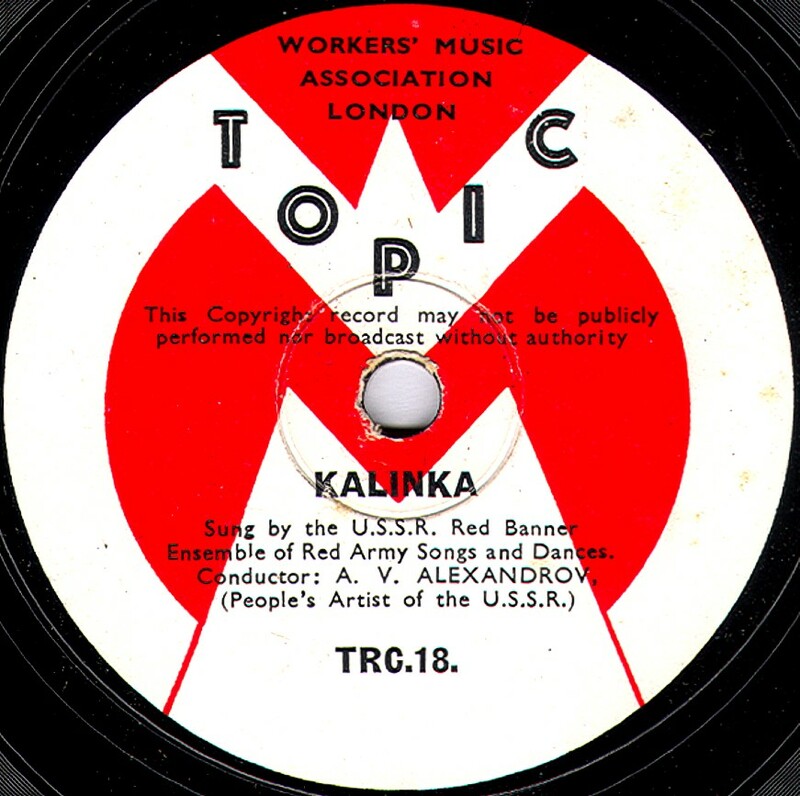 Topic This label was owned by The Workers Music Association and the Topic records were launched in the late 1930s with catalogue number TR-1. 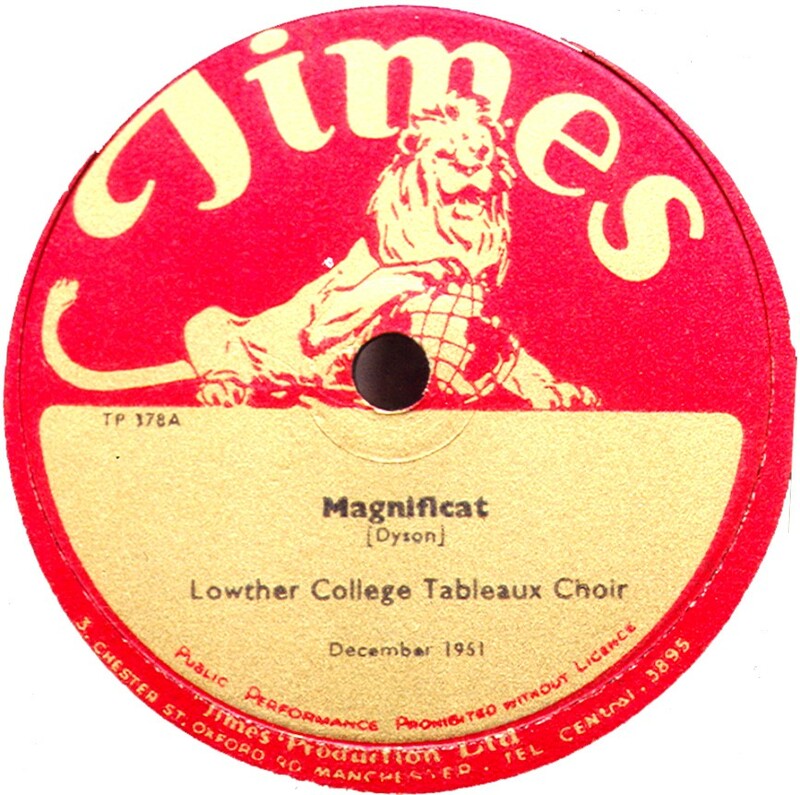 The 78s were issued spasmodically, in both 10" and 12" sizes until the late 1950s by which time they were being issued on 45rpm records. 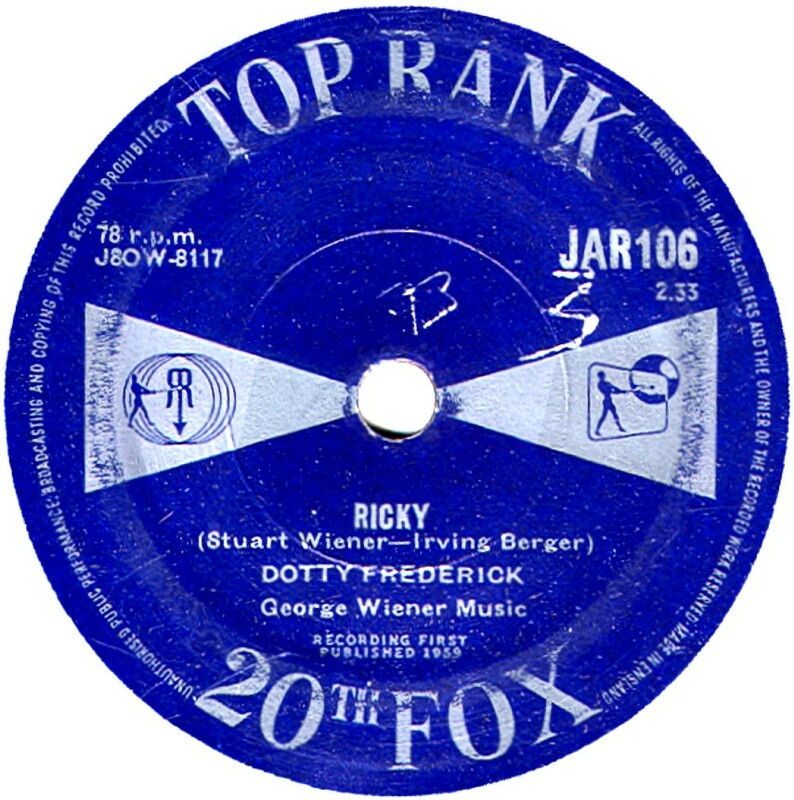 The highest 78rpm record being TR-108 issued in 1958. 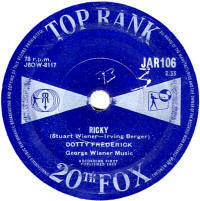 Top Rank Top Rank records, dating from the late 1950s, was an attempt by the Rank Film Organisation to beak into the British record business. 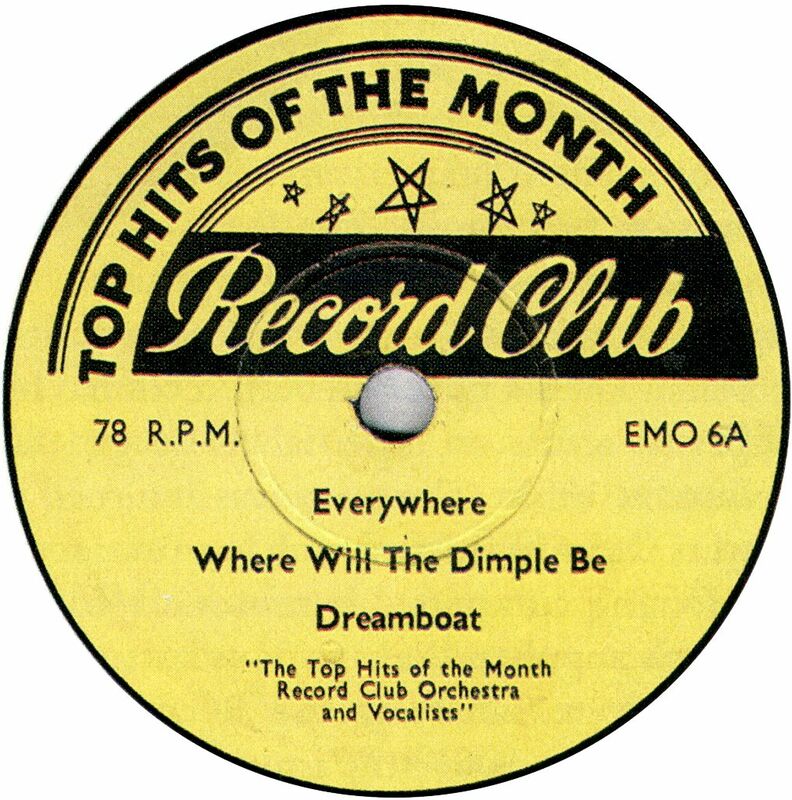 These 78rpm records, pressed in vinyl had a catalogue series starting at JAR-101 in 1958, but by 1960 the business failed and the label was taken on by EMI and the 78rpm records dropped immediately. 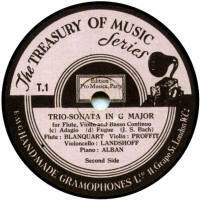 I believe the 78rpm series reached JAR-432. 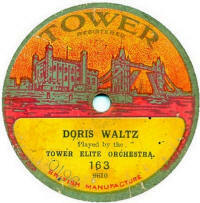 Tower Dating from the early 1920s, Tower records was a Vocalion product, often using old masters previous issued on Vocalion or one of their other subsidiary labels. Masters also came from Gennett (in America) and the catalogue number was in a 100-series (for 10") and 2000-series for 12". 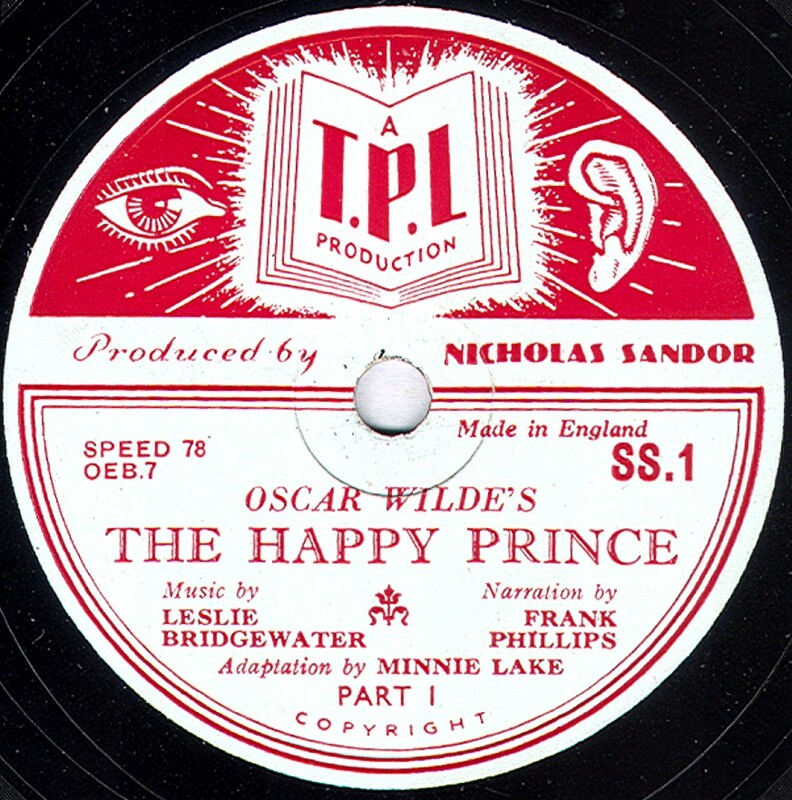 This was the record part of a talking book, the book part reproducing the text of Oscar Wilde’s story “The Happy Prince”. The trade distributors for the talking books were Horace Marshall & Son Ltd., Temple House, Temple Avenue, London, E.C.4. The book part was produced in France by Le Livre Universal and was printed by Imprimerie Crété. A French “depot legal” (deposit for copyrighting purposes) date of the third quarter of 1948 is given which gives a rough date for the records. You will find an entry for Nicholas Sandor, a Hungarian engineer and inventor, under www.gracesguide.co.uk but this doesn’t shed any light on his connection with talking books. He was an inventor and patented quite a number of his inventions and the title page of the book states “Patent applied for” but it is difficult to see just what was novel and hence patentable about a talking book. 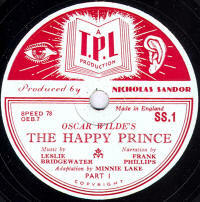 The record has matrix numbers 0EB7-3 for Part 1 and 0EB8–3 for Part 2 and was produced by The Gramophone Co. 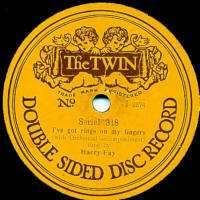 I know of one other record in the same series, SS.3 (matrix numbers 0EB27-1 and 0EB28-1) , which was The Magic Wood, story and music by Harry Phillips, so there should have been an SS.2 as well and possibly other issues after SS.3. 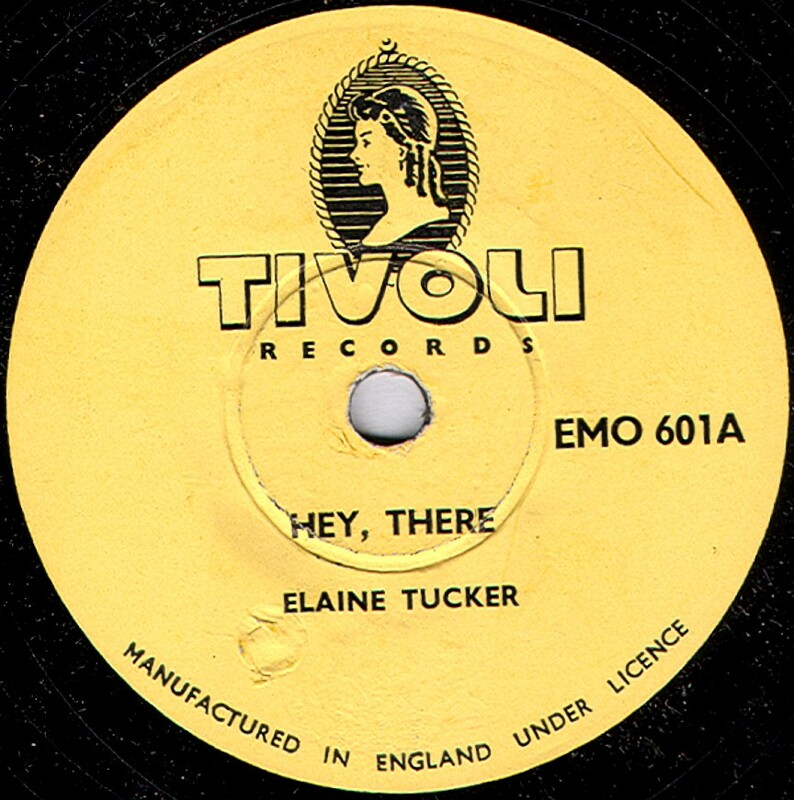 Thanks to Bill Dean-Myatt for the label image, and to Dave Mason for providing the information about the label. Transacord This company was started by Peter Handford who was an experienced sound engineer & sound effects expert. 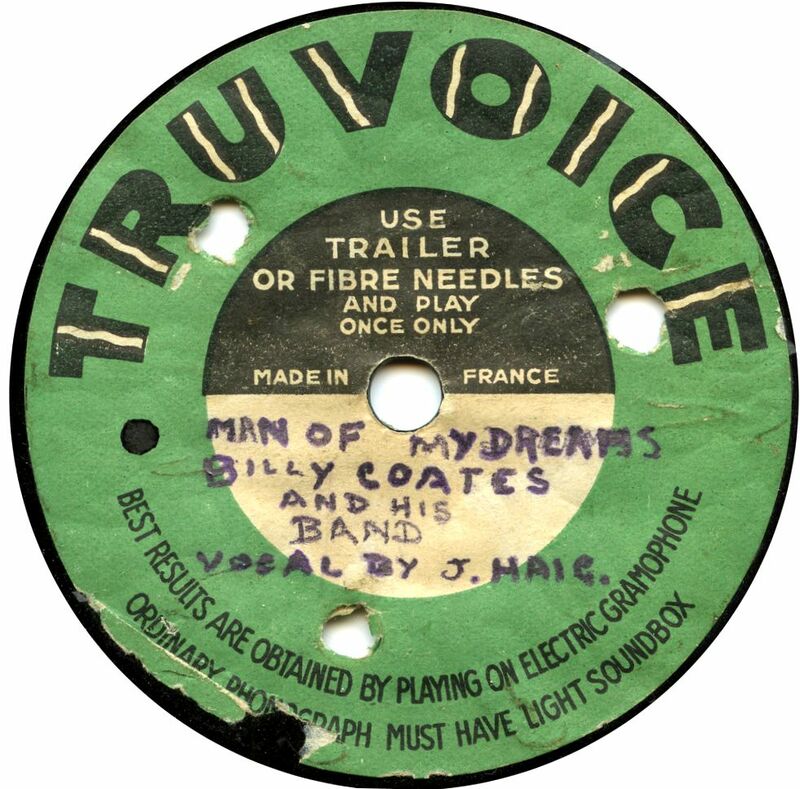 In 1953, with just a tape recorder & a 78rpm lacquer disc cutter, he offered private recordings and also recordings of amatuer music events and competitions. He would cut the records himself, from his tape recording, unless more than 12 copies were required, in which case he would get recprds pressed by British Homophone. 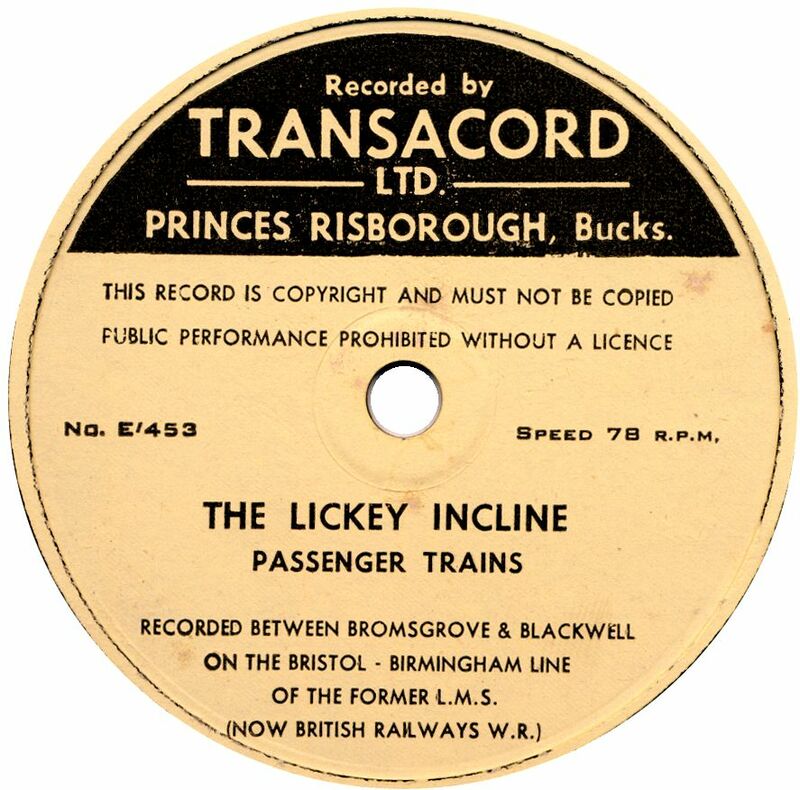 In 1954, he heard an American LP of railway sounds and decided to try something similar with British railways. 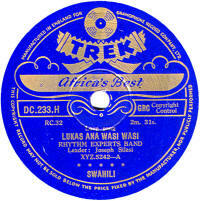 His first records in this style were issued in 1955 on 78rpm discs. 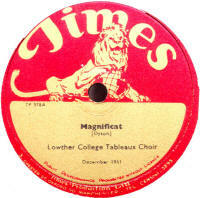 In 1958, after about half-a-dozen 78rpm issues (10" and 12" sizes), Peter switched to the LP and 45rpm format. Transacord was later taken over by Argo Records and subsequently became part of Decca. Transworld This appears to be a publisher's library music outlet for Television Music Ltd. The records were made by C.H. Rumble Ltd of Redhill, Surrey and date from 1961 to 1965. All were pressed in vinyl and the catalogue series ran from TR-1 to TR-99. Treasury Of Music These records were made for EMG Hand Made Gramophones and were first accounced in 1935. These were 12" records priced at 6/- each, and most likely were pressed from French masters, though it is not known who made them. The catalogue numbers started at T-1 and ran to at leaast T-17. 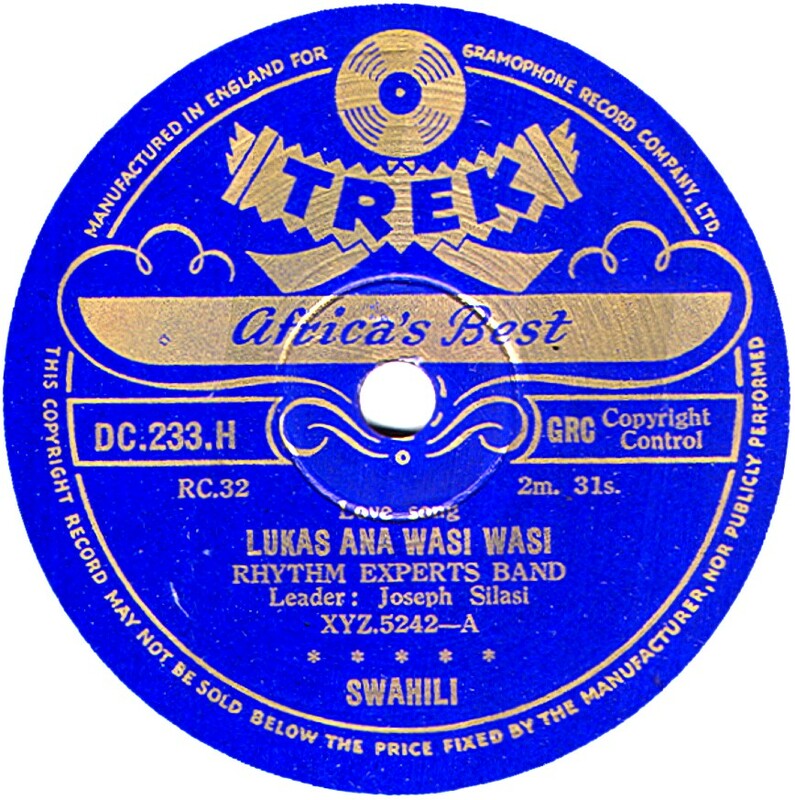 Trek These were recorded in South Africa by Eric Gallo's Gramophone Records Ltd, and pressed by Decca in England, from 1940 until 1942, when shipping problems caused by WWII put an end to the imports. After the war, in 196, Gallo resurrected the label much as before but within a couple of years (in 1949) had built his own presseing plant, thus no longer needing Decca's pressing services. There were two atalogue series: AC-700- for Afrikaans material, and DC-1- for other African music. These reached AC-820 and DC-47 by the time of the war break. The post-war issues contiued with the same series, eventually reaching AC-1046 and DC-399, though the last ones may have been 45rpm issues. 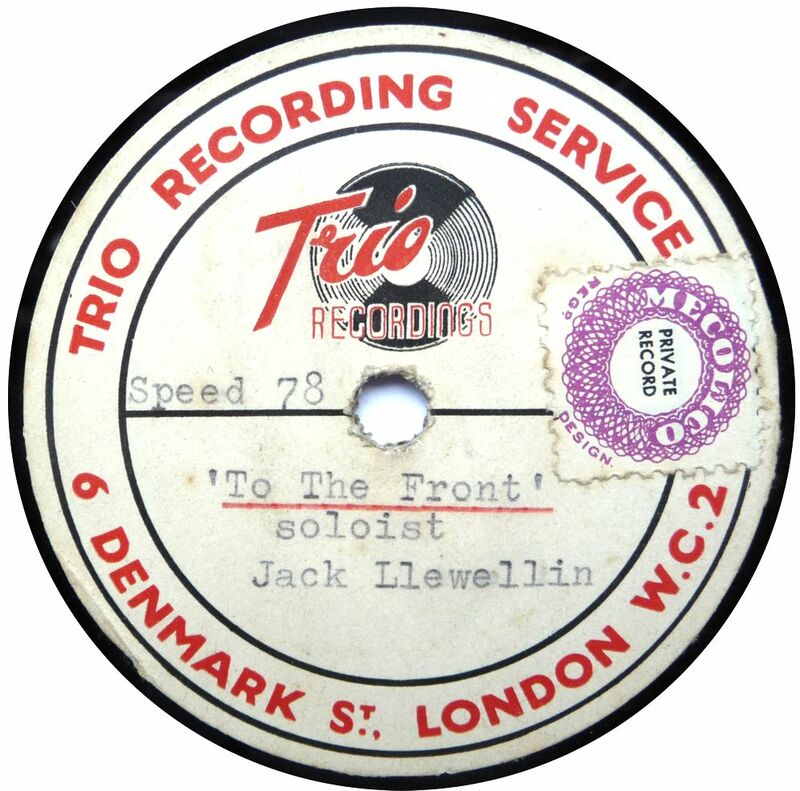 Trio Little is known of this private recording company, other than what can be seen on the label on the only reported copy here. 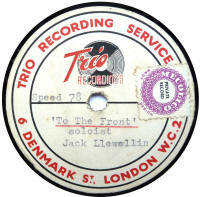 Jack Llewellin was an actor and here he performs an extract from a play, probably dating from the 1950s. Triumph The first Triumph Record was manufactured in Germany, uning Invicta (Berolina) masters. The catalogue numbers are the same as the Invicta issues, but with 20 in front of the number, hence the one shown here, Triumph 20342 is the same issue & coupling as Invicta 342. It is not known who the Triumph records were produced for, but they will all pre-date the outbreak of WWI in 1914, and most likely stopped well before then. They are even scarcer than the Invicta issues, which are by no means common themselves. At some point in early 1914, most likely after the German Triumphs had ceased, a British-made Triumph Record was launched. These were made by the Disc Record Company at Harrow, for Joseph Blum & Co, using original masters recorded by Blum. The labels can be found in either dark blue or red, with gold printing. 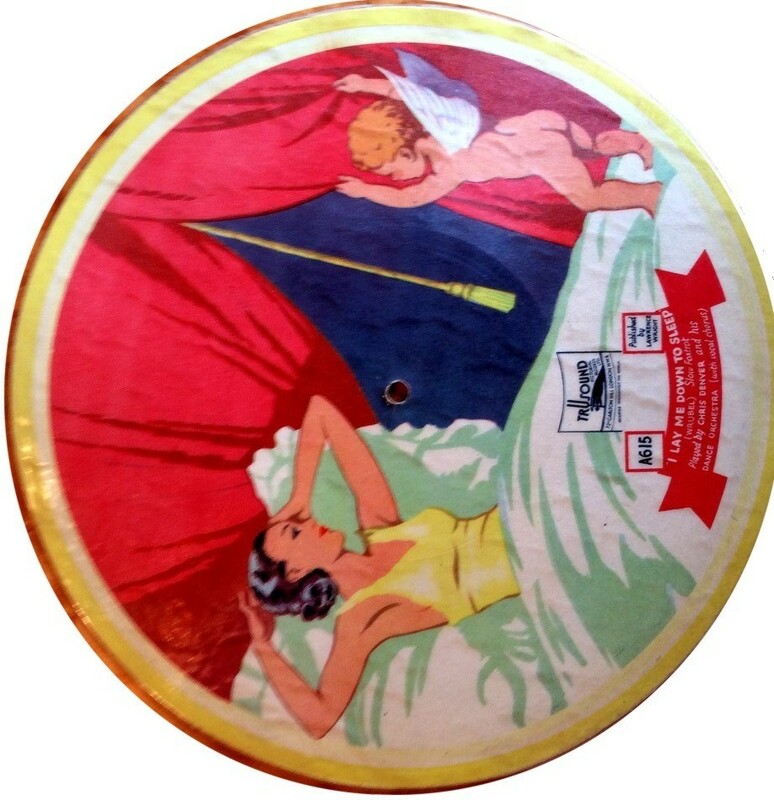 Again these, like the German ones, were quite short-lived (and hence scarce today) as both the Disc Record Company and Joseph Blum's company went out of business in 1915. 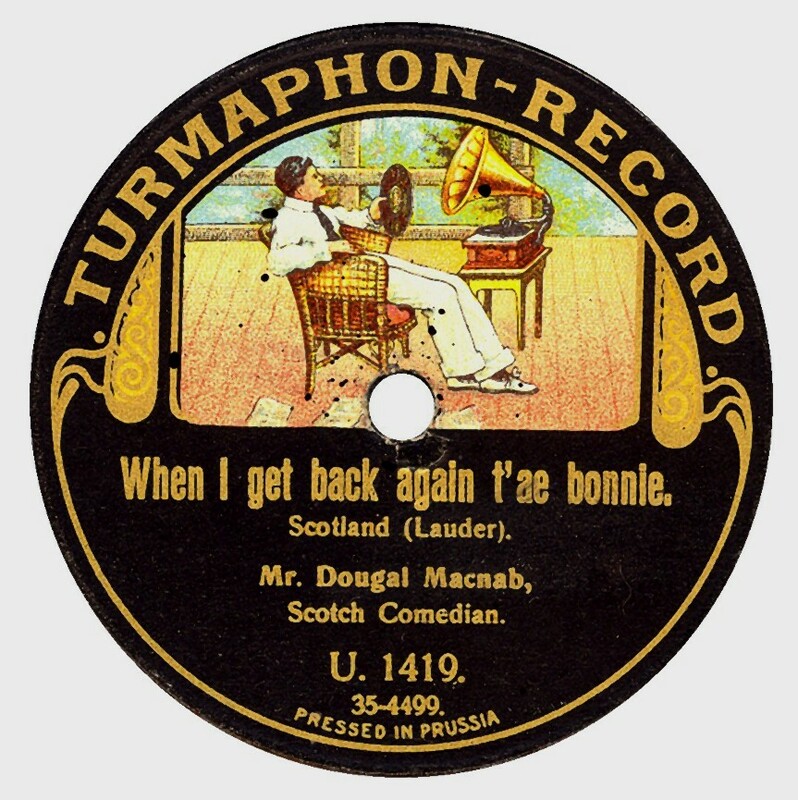 Trusound One of the earliest flexible picture discs, Trusound date from the early 1930s and are scarce today, and even when they turn up, they are often unplayable. 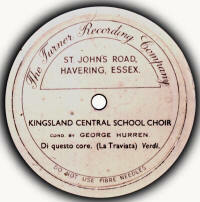 The recordings are a mixture of continental masters and those recorded by Trusound themselves. 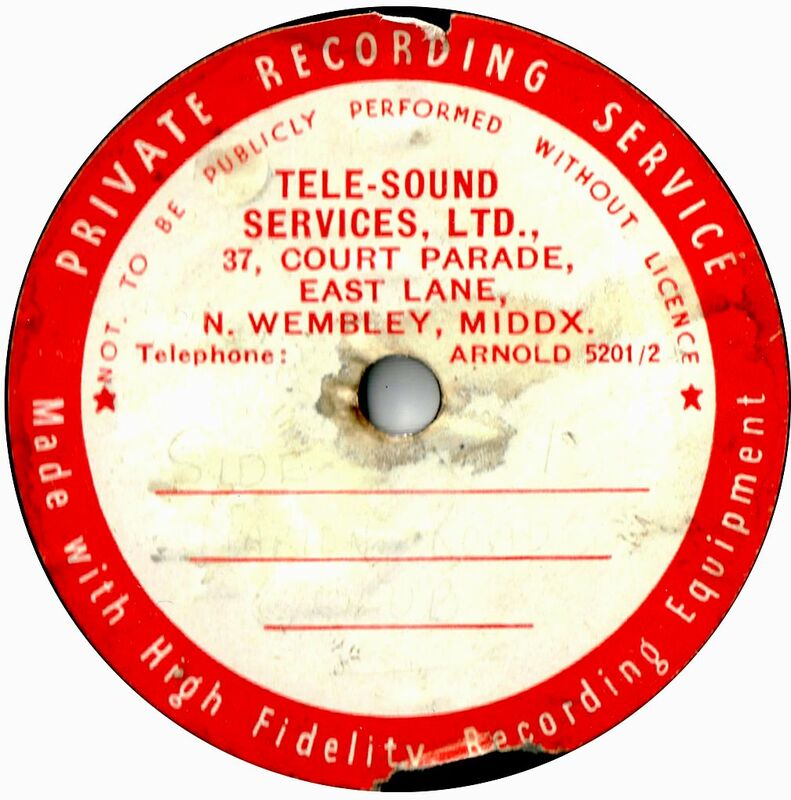 The Trusound recording studio was in a former church at 72a Carlton Hill, St. John's Wood, London, NW8 and up until Trusound took it on in 1933, it had been the Parlophone recording studio. 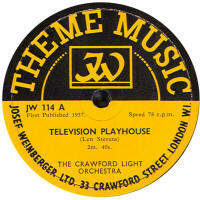 The manager during Trusound's ownershop, was a Mr. Francis, who had been a deputy of the Parlophone manager, Oscar Preuss. 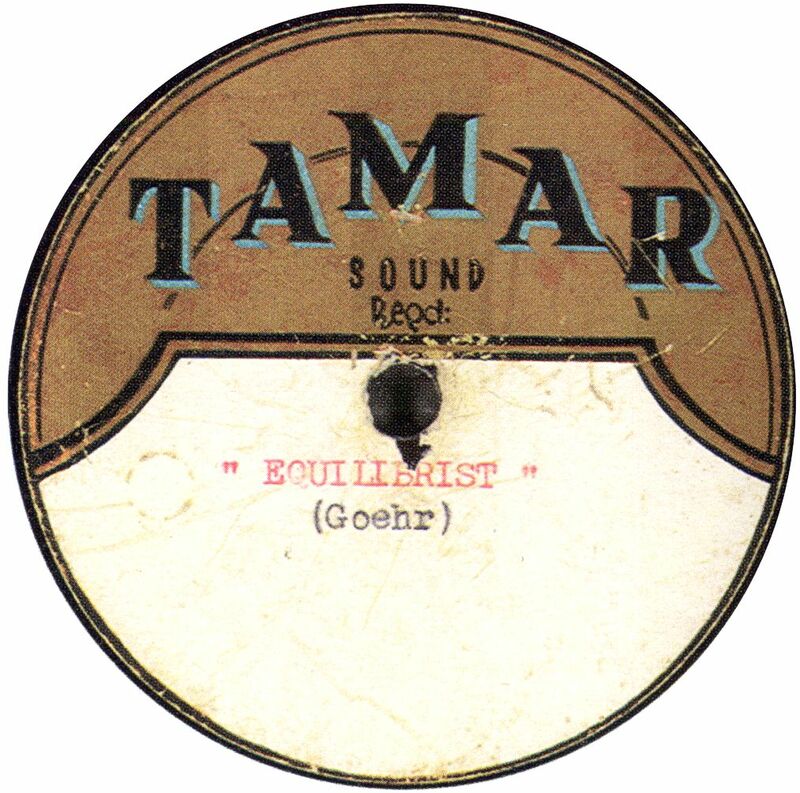 Trusound records cost 1/6. 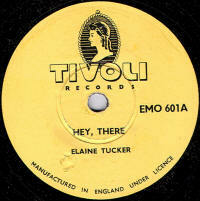 There seem to be about 50 different records, but in various catalogue series such as T-1, A-600, A-1000 and B-500-. Truvoice The record, which is a lacquer coating on a steel base says "Made in France" on the label, but the band recorded was based in Leeds, Yorkshire. Dates from about 1936. Actually, this label should not actually be listed here as it appears to be the manufacturer of the laquer disc (which is not British) rather than a company record label. 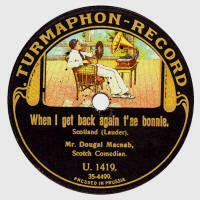 Turmaphon Turmaphon records were manufactured by the Turmalin factory in Germany and the example shown here was specifically produced for export to Britain. The few seen all have a U-series catalogue number, though a couple have different numbers on each side, just to make things difficult for 21st century discographers! All the issues shown here seem to be using previously-recorded masters from the defunct Bel Canto company. Thanks to Michael Gunrem for the label scan. 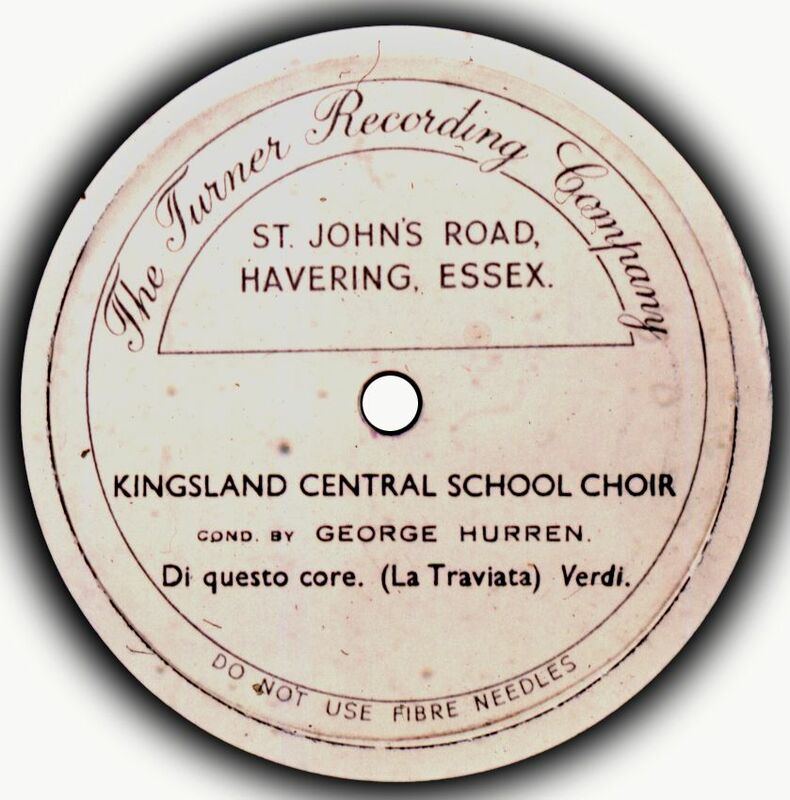 Turner A Private recording company based in Havering, Essex, dating from the post WWII period. 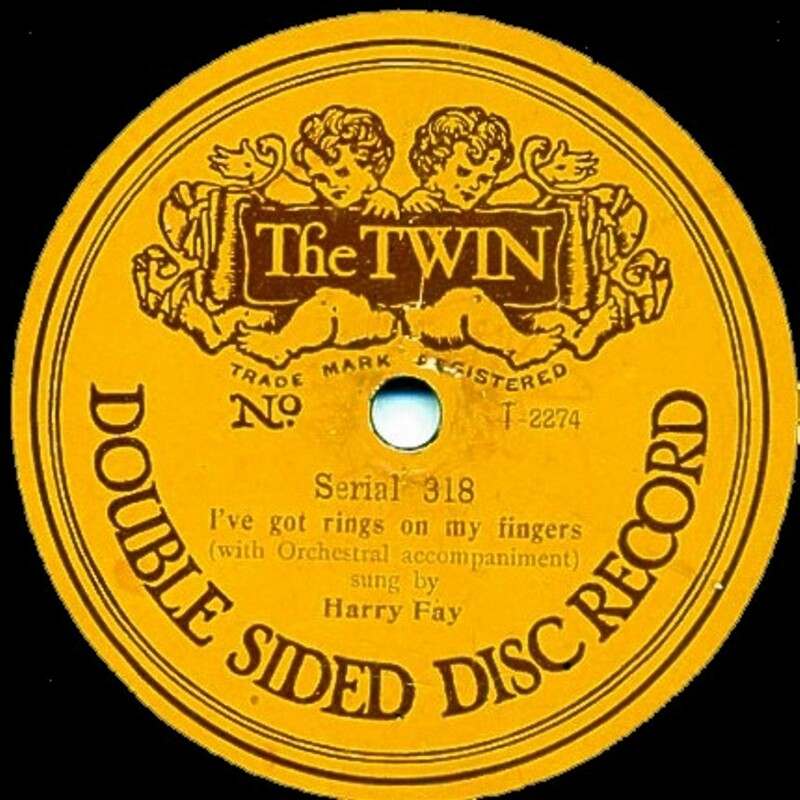 Twin When the Gramophone Company decided to embark on producing double-sided records in 1908, rather than risk their reputation on producing double-sided HMV records, they decided to launch a new label called "Twin". 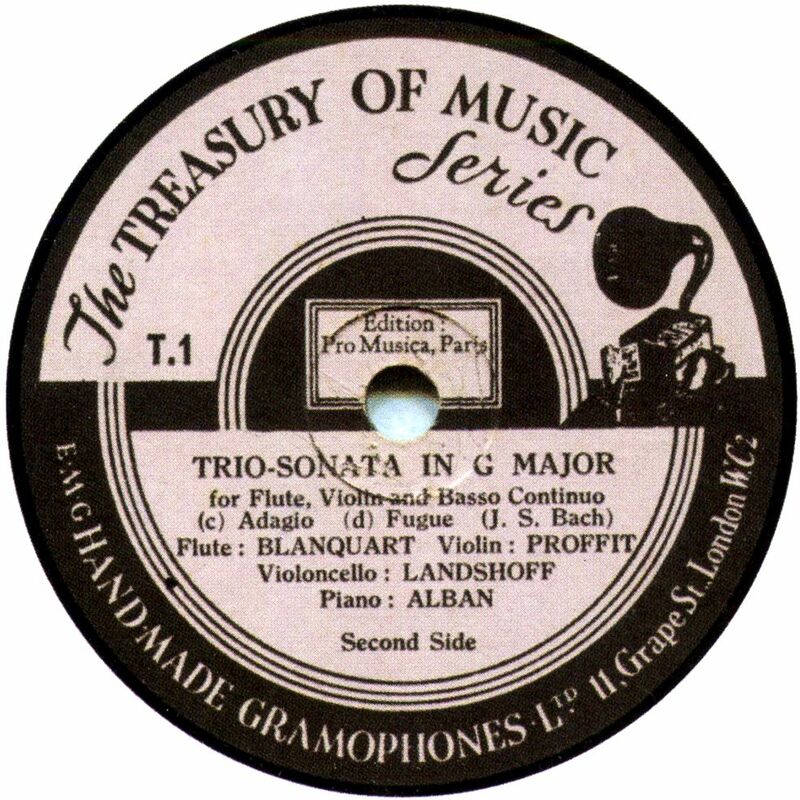 Costing 2/6, the records used existing single-sided Zonophone masters to start with, until, in 1911, with the catalogue reaching about 600 (having started from 1), the two were combined and the double-sided Zonophone-Twin label became the Gramophone company's secondary label. 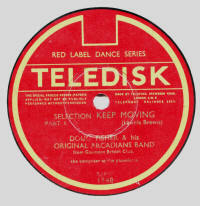 Any which then remained in the catalogue were re-pressed with Zonophone labels. 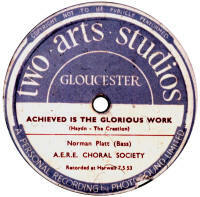 Two Arts Studios Thanks to Bill Dean-Myatt for the label image.